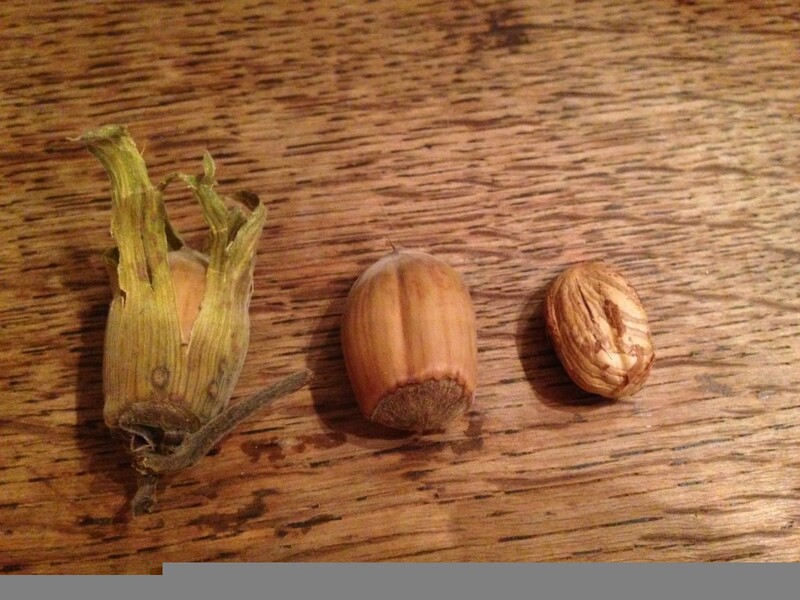 It’s cobnut season again. Every year I buy a big bag, forgetting just how hideous it is to prep a kilo of nuts, and so they languish on the kitchen counter for a week until it can be put off no longer. 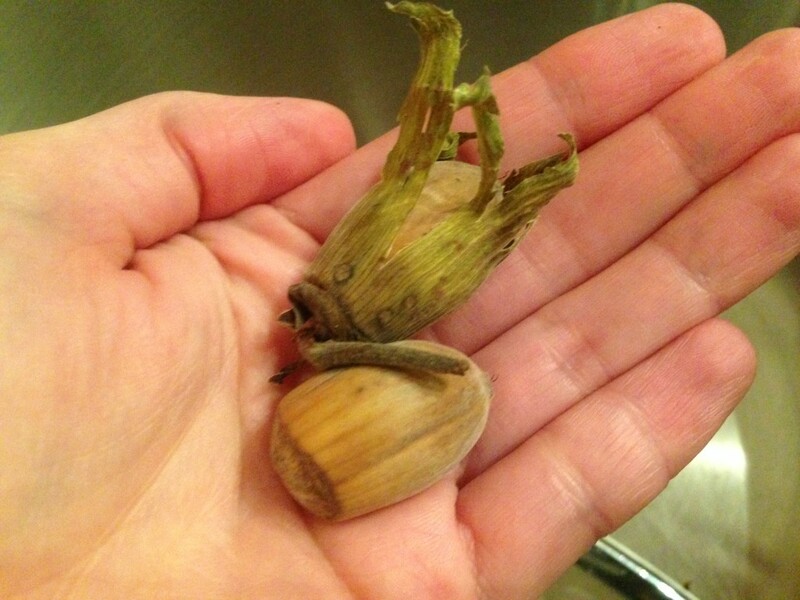 Cobnuts are cultivated hazelnuts and unlike other nuts they’re not dried but eaten fresh. Once you’ve got past the tedium of breaking through all the shells, you’re rewarded with a white, milky, mild-tasting nut. The prepped nuts can be toasted and dressed with seasalt as a snack, or use them in salads or baking. It took 45 minutes to prep about 750g – which was the precise same time as it took to bake a tray of maple-apple turnovers. That’s how multi-tasking works in this household. These beautiful bramleys were gifted to my folks by their plumber, who lives on Castlemorton Common near Malvern. I know people say the best way to keep your apple harvest is by housing them in a shed or garage but it’s all nonsense: keep them in the fridge and they will last for weeks. This requires a big fridge of course. 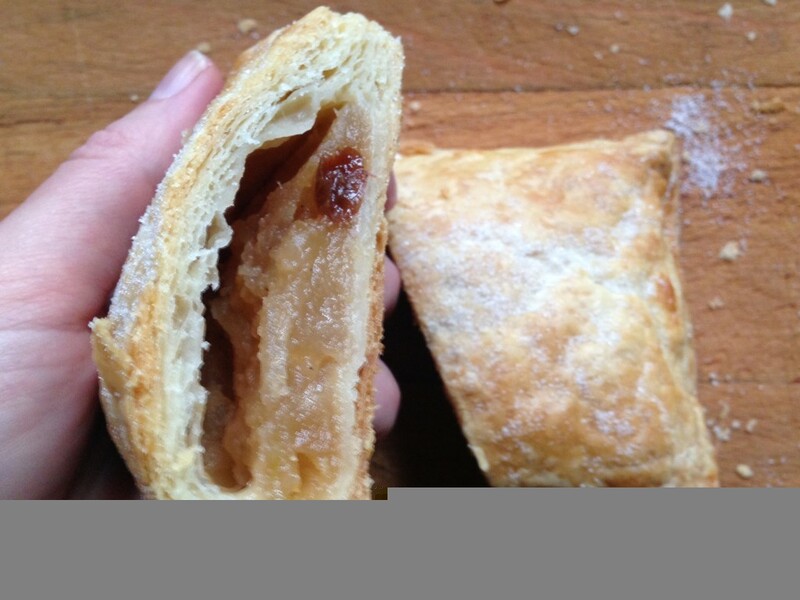 Bramleys to me mean apple pie…and it’s not a great leap from apple pie to apple turnovers. Add in a bit of maple syrup and we have a lovely autumn pud. First you need to make some pastry. I say this – ready-made puff or shortcrust would do fine, but sometimes it’s good to make an extra effort and make a flaky rough-puff from scratch. Don’t tell anyone, but it’s EASIER to make rough-puff than it is shortcrust; all you need is a cheese-grater. Really. By grating the butter in to the flour rather than rubbing it (as you’d normally do), you get large lumps of fat in the pastry. These melt in the oven, creating pockets of steam that cause the pastry to rise. Science! While the pastry’s chilling, make the filling. I used a mixture of bramleys and eating apples as I like the firm texture of the latter, but really you could use whatever you like. 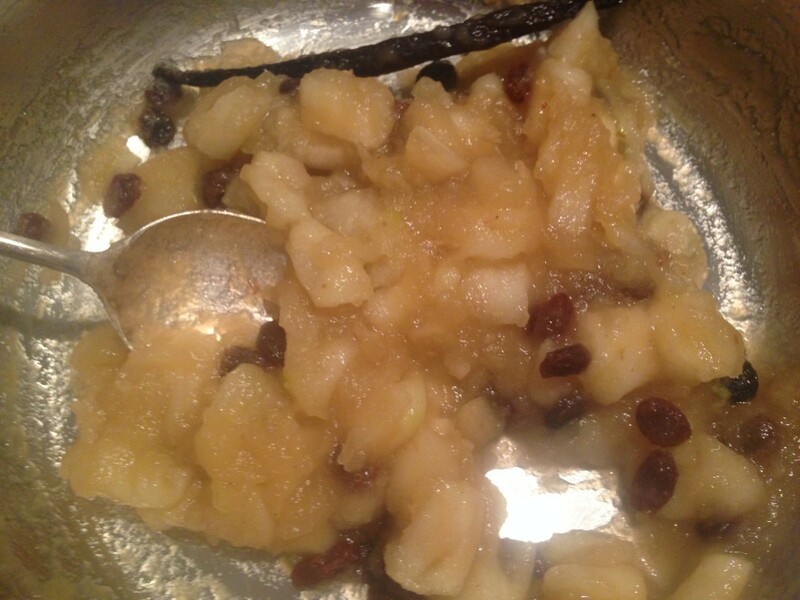 Peel, core and dice the apples, then cook over a low heat with raisins, sugar, vanilla and maple syrup. It will cook to a golden mass, faintly flavoured with maple. If you want a REAL maple hit, consider using maple extract or maple sugar instead of syrup. Finally, we make up our turnovers. This is a mid-week snack so no need for perfection: roll the pastry to the thickness of a ten-pence coin then slice into rectangles. Pile a scant tablespoon of filling on one side, leaving a rim of pastry, then fold the pastry over and seal. Make little holes for steam, brush with milk, and bake. At this point, if inclined, you can prep a bag of cob-nuts…or not. They are crisp and light and you’ll see the layers of pastry. Serve up warm with custard (heaven) or cold with whipped cream for a retro special treat. The basic recipe can be adapted for any filling you like – raspberries are good, as are blueberries. Simply freeze any leftovers for another day. First, make your pastry. Place the flour and sugar in a large bowl then grate in the butter using a cheese grater. Use a dinner-knife to toss the butter around in the flour. We don’t want to cut the butter, just mix it into the flour. There should be discernible shreds of butter. Add cold water a tablespoon at a time until the pastry starts to gather into lumps. Use your hands to bring it together into a ball then knead briefly to form a smooth paste. Shape into a disc then chill until needed. Peel, core and dice the apples, then place them in a pan with the sugar, syrup, raisins, maple and vanilla. Cook on a low heat for ten to fifteen minutes, until the apples are cooked into a golden mass. Add a little water if it looks too dry. 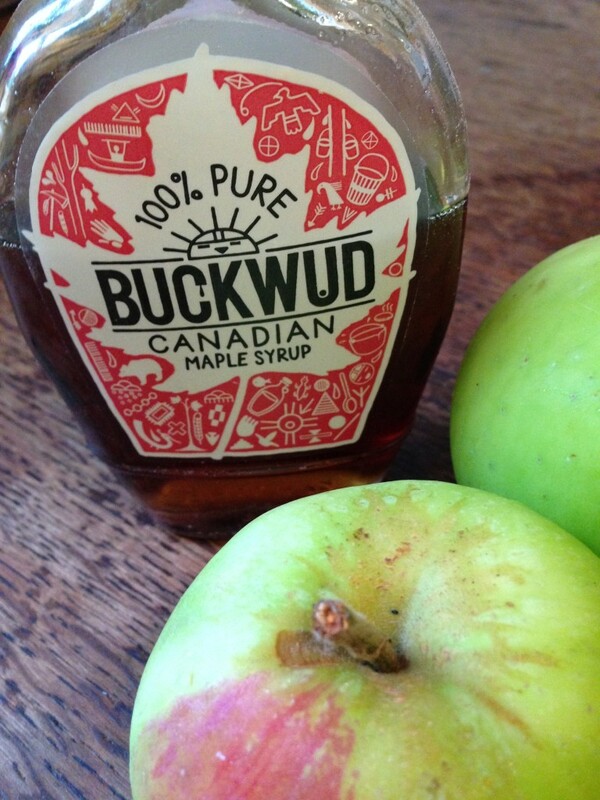 Check for flavour and add more syrup or sugar if required. Leave to cool. Pre-heat the oven to 190c. Roll out the pastry to the thinness of a ten pence coin. Using a sharp knife, cut the pastry into rectangles – make them as large as you like, depending on how big you want your turnovers to be. 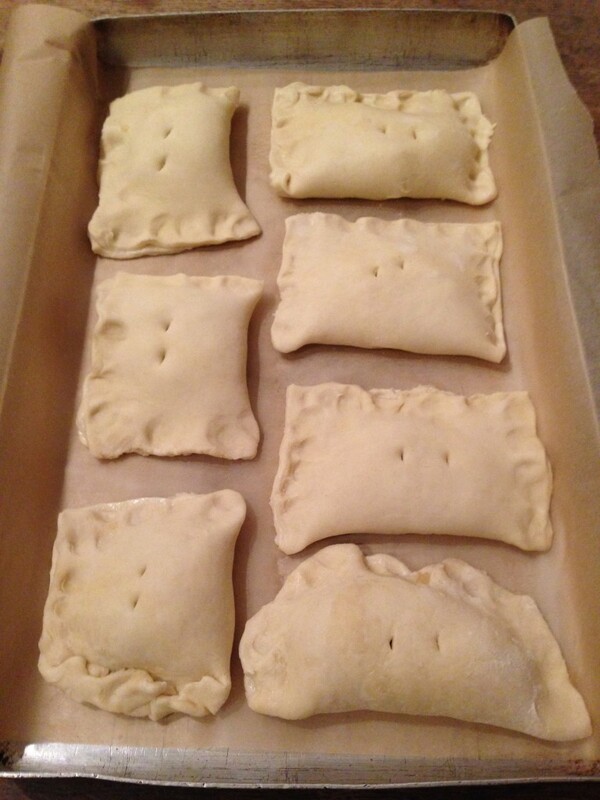 Place a spoonful of filling on one side of the rectangles but leave a margin of pastry. Don’t overfill them else they’ll explode in the oven. Fold the pastry over the filling and seal the edges, use cold water to help the pastry stick together. Transfer to a baking sheet, prick each pastry with a sharp knife and brush with milk. Bake for about 35-45 minutes, until golden and risen. Dust with caster sugar to serve. 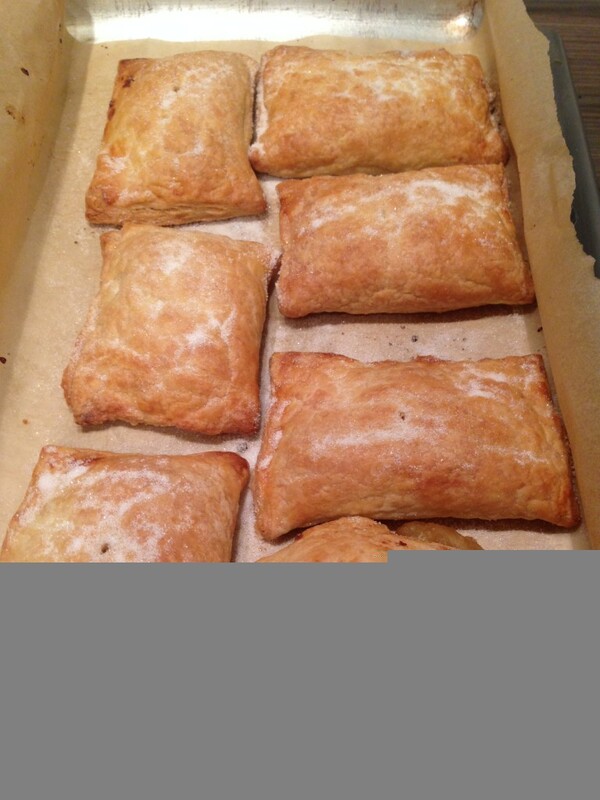 This entry was posted in Recipes, Sweet and tagged apples, cobnuts, flaky pastry, turnovers. Bookmark the permalink. I love reading Helen’s allotment news. My mother taught me to crack cob nuts like this :- remove the leafy outer coat. With a penknife, shave a little bit off the (pointed) top of the nutcase until you can see a little line/crack. Insert the tip of the penknife into the crack, and twist the knife. With any luck, the case splits in two, freeing the delicious nut.